A man who is convinced of the truth of his religion is indeed never tolerant. At the least, he is to feel pity for the adherent of another religion but usually it does not stop there. The faithful adherent of a religion will try first of all to convince those that believe in another religion and usually he goes on to hatred if he is not successful. However, hatred then leads to persecution when the might of the majority is behind it. A stone arrowhead is as convincing as a steam-engine. As proof that there has been a continuing advance of technology since prehistoric times. In 'A Law of Acceleration' (1904), The Education of Henry Adams: An Autobiography (1918), 493. After that, I thought about what a proposition generally needs in order to be true and certain because, since I had just found one that I knew was such, I thought I should also know what this certainty consists in. Having noticed that there is nothing at all in the proposition “I think, therefore I am” [cogito ergo sum] which convinces me that I speak the truth, apart from the fact that I see very clearly that one has to exist in order to think, I judged that I could adopt as a general rule that those things we conceive very clearly and distinctly are all true. The only outstanding difficulty is in recognizing which ones we conceive distinctly. Discourse on Method in Discourse on Method and Related Writings (1637), trans. Desmond M. Clarke, Penguin edition (1999), Part 4, 25. As advertising always convinces the sponsor even more than the public, the scientists have become sold, and remain sold, on the idea that they have the key to the Absolute, and that nothing will do for Mr. Average Citizen but to stuff himself full of electrons. 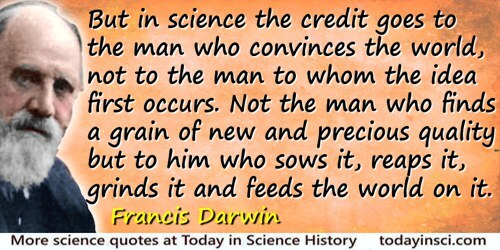 In Science is a Sacred Cow (1950), 26. First Galton Lecture before the Eugenics Society', Eugenics Review, 1914, 6, 9. Genetics seems to be everything to those who have convinced themselves they have arisen from worthy ancestors. Epigraph in Isaac Asimov’s Book of Science and Nature Quotations (1988), 104. I had rather believe all the Fables in the Legend, and the Talmud, and the Alcoran, then that this universall Frame, is without a Minde. And therefore, God never wrought Miracle, to convince Atheisme, because his Ordinary Works Convince it. It is true, that a little Philosophy inclineth Mans Minde to Atheisme; But depth in Philosophy, bringeth Mens Mindes about to Religion. 'Of Atheisme' (1625) in James Spedding, Robert Ellis and Douglas Heath (eds. ), The Works of Francis Bacon (1887-1901), Vol. 6, 413. I will frankly tell you that my experience in prolonged scientific investigations convinces me that a belief in God—a God who is behind and within the chaos of vanishing points of human knowledge—adds a wonderful stimulus to the man who attempts to penetrate into the regions of the unknown. If you have to prove a theorem, do not rush. First of all, understand fully what the theorem says, try to see clearly what it means. Then check the theorem; it could be false. Examine the consequences, verify as many particular instances as are needed to convince yourself of the truth. When you have satisfied yourself that the theorem is true, you can start proving it. In man, then, let us take the amount that is extruded by the individual beats, and that cannot return into the heart because of the barrier set in its way by the valves, as half an ounce, or three drachms, or at least one drachm. In half an hour the heart makes over a thousand beats; indeed, in some individuals, and on occasion, two, three, or four thousand. If you multiply the drachms per beat by the number of beats you will see that in half an hour either a thousand times three drachms or times two drachms, or five hundred ounces, or other such proportionate quantity of blood has been passed through the heart into the arteries, that is, in all cases blood in greater amount than can be found in the whole of the body. Similarly in the sheep or the dog. Let us take it that one scruple passes in a single contraction of the heart; then in half an hour a thousand scruples, or three and a half pounds of blood, do so. In a body of this size, as I have found in the sheep, there is often not more than four pounds of blood. In the above sort of way, by calculating the amount of blood transmitted [at each heart beat] and by making a count of the beats, let us convince ourselves that the whole amount of the blood mass goes through the heart from the veins to the arteries and similarly makes the pulmonary transit. Even if this may take more than half an hour or an hour or a day for its accomplishment, it does nevertheless show that the beat of the heart is continuously driving through that organ more blood than the ingested food can supply, or all the veins together at any time contain. De Motu Cordis (1628), The Circulation of the Blood and Other Writings, trans. Kenneth J. Franklin (1957), Chapter 9, 62-3. In want of other proofs, the thumb would convince me of the existence of a God. It has long been a complaint against mathematicians that they are hard to convince: but it is a far greater disqualification both for philosophy, and for the affairs of life, to be too easily convinced; to have too low a standard of proof. The only sound intellects are those which, in the first instance, set their standards of proof high. Practice in concrete affairs soon teaches them to make the necessary abatement: but they retain the consciousness, without which there is no sound practical reasoning, that in accepting inferior evidence because there is no better to be had, they do not by that acceptance raise it to completeness. In An Examination of Sir William Hamilton’s Philosophy (1878), 611. It is now necessary to indicate more definitely the reason why mathematics not only carries conviction in itself, but also transmits conviction to the objects to which it is applied. The reason is found, first of all, in the perfect precision with which the elementary mathematical concepts are determined; in this respect each science must look to its own salvation .... But this is not all. As soon as human thought attempts long chains of conclusions, or difficult matters generally, there arises not only the danger of error but also the suspicion of error, because since all details cannot be surveyed with clearness at the same instant one must in the end be satisfied with a belief that nothing has been overlooked from the beginning. Every one knows how much this is the case even in arithmetic, the most elementary use of mathematics. No one would imagine that the higher parts of mathematics fare better in this respect; on the contrary, in more complicated conclusions the uncertainty and suspicion of hidden errors increases in rapid progression. How does mathematics manage to rid itself of this inconvenience which attaches to it in the highest degree? By making proofs more rigorous? By giving new rules according to which the old rules shall be applied? Not in the least. A very great uncertainty continues to attach to the result of each single computation. But there are checks. In the realm of mathematics each point may be reached by a hundred different ways; and if each of a hundred ways leads to the same point, one may be sure that the right point has been reached. A calculation without a check is as good as none. Just so it is with every isolated proof in any speculative science whatever; the proof may be ever so ingenious, and ever so perfectly true and correct, it will still fail to convince permanently. He will therefore be much deceived, who, in metaphysics, or in psychology which depends on metaphysics, hopes to see his greatest care in the precise determination of the concepts and in the logical conclusions rewarded by conviction, much less by success in transmitting conviction to others. Not only must the conclusions support each other, without coercion or suspicion of subreption, but in all matters originating in experience, or judging concerning experience, the results of speculation must be verified by experience, not only superficially, but in countless special cases. In Werke [Kehrbach] (1890), Bd. 5, 105. As quoted, cited and translated in Robert Édouard Moritz, Memorabilia Mathematica; Or, The Philomath’s Quotation-Book (1914), 19. It seems that the rivers know the theory. It only remains to convince the engineers of the validity of this analysis. My view of life is that it’s next to impossible to convince anybody of anything. (20 Feb 1890). Quoted in Stuart Dodgson Collingwood, The Life and Letters of Lewis Carroll (1898), 291. Only reason can convince us of those three fundamental truths without a recognition of which there can be no effective liberty: that what we believe is not necessarily true; that what we like is not necessarily good; and that all questions are open. In Civilization: An Essay (1928), 125. The electrical matter consists of particles extremely subtile, since it can permeate common matter, even the densest metals, with such ease and freedom as not to receive any perceptible resistance. If anyone should doubt whether the electrical matter passes through the substance of bodies, or only over along their surfaces, a shock from an electrified large glass jar, taken through his own body, will probably convince him. Electrical matter differs from common matter in this, that the parts of the latter mutually attract, those of the former mutually repel each other. 'Opinions and Conjectures, Concerning the Properties and Effects of the Electrical Matter, arising from Experiments and Observations, made at Philadelphia, 1749.' In I. Bernard Cohen (ed. 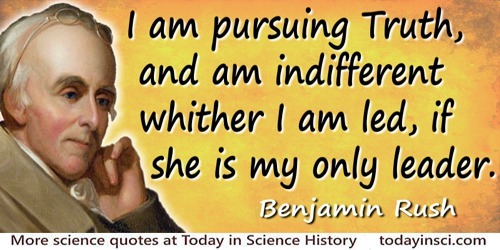 ), Benjamin Franklin's Experiments (1941), 213. The people of Sydney who can speak of my work [on flying-machine models] without a smile are very scarce; it is doubtless the same with American workers. I know that success is dead sure to come, and therefore do not waste time and words in trying to convince unbelievers. As quoted in Octave Chanute, Progress in Flying Machines (1894), 231. To show, therefore, that we are capable of knowing, i.e. being certain that there is a God, and how we may come by this certainty, I think we need go no further than ourselves, and that undoubted knowledge we have of our own existence... For man knows that he himself exists... If any one pretends to be so sceptical as to deny his own existence, (for really to doubt of it is manifestly impossible,) let him for me enjoy his beloved happiness of being nothing, until hunger or some other pain convince him of the contrary... He knows also that nothing cannot produce a being; therefore something must have existed from eternity... Next, it is evident, that what had its being and beginning from another, must also have all that which is in and belongs to its being from another too. All the powers it has must be owing to and received from the same source. This eternal source, then, of all being must also be the source and original of all power; and so this eternal Being must be also the most powerful... And most knowing. Again, a man finds in himself perception and knowledge. We have then got one step further; and we are certain now that there is not only some being, but some knowing, intelligent being in the world. There was a time, then, when there was no knowing being, and when knowledge began to be; or else there has been also a knowing being from eternity...And therefore God. Essay Concerning Human Understanding (1690), book 4, ch. 10, sec 19. Undoubtedly, the capstone of every mathematical theory is a convincing proof of all of its assertions. Undoubtedly, mathematics inculpates itself when it foregoes convincing proofs. But the mystery of brilliant productivity will always be the posing of new questions, the anticipation of new theorems that make accessible valuable results and connections. Without the creation of new viewpoints, without the statement of new aims, mathematics would soon exhaust itself in the rigor of its logical proofs and begin to stagnate as its substance vanishes. Thus, in a sense, mathematics has been most advanced by those who distinguished themselves by intuition rather than by rigorous proofs. As quoted in Hermann Weyl, Unterrichtsblätter für Mathematik und Naturwissenschaften (1932), 38, 177-188. As translated by Abe Shenitzer, in 'Part I. Topology and Abstract Algebra as Two Roads of Mathematical Comprehension', The American Mathematical Monthly (May 1995), 102, No. 7, 453. What I am going to tell you about is what we teach our physics students in the third or fourth year of graduate school… It is my task to convince you not to turn away because you don’t understand it. You see my physics students don’t understand it… That is because I don’t understand it. Nobody does. From Lecture, the first in the first series of Alix G. Mauntner Lectures, trascribed and editted by Ralph Leighton, 'Introduction', QED, The Strange Theory of Light and Matter (1985, 1988), 9. You can hardly convince a man of error in a life-time, but must content yourself with the reflection that the progress of science is slow. If he is not convinced, his grand-children may be. The geologists tell us that it took one hundred years to prove that fossils are organic, and one hundred and fifty more, to prove that they are not to be referred to the Noachian deluge. In A Week on the Concord and Merrimack Rivers (1862), 68. You will never convince some palaeontologists that an impact killed the dinosaurs unless you find a dinosaur skeleton with a crushed skull and a ring of iridium round the hole. Quoted in 'Extinction Wars' by Stell Weisburd, Science News (1 Feb 1986), 77.